First, I am not a steak fan, and I had salmon already for 3 meals, so the menu left me very little to choose from. BUT I wasn’t very hungry, either. I asked the chef for dairy free pasta with olive oil and spinach. He offered a Mediterranean vegetable medley over pasta, dairy free. It was delicious. It was my favorite meal of the trip! Now, these noodles are not gluten free, but you can certainly get the same dish with gluten free noodles. I just loved it. Very simple, very satisfying. 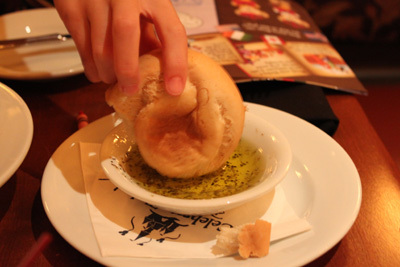 We also had rolls and I asked for balsamic vinegar and olive oil for dipping. Bean had steak, which she does love. She enjoyed the carrots and potatoes. 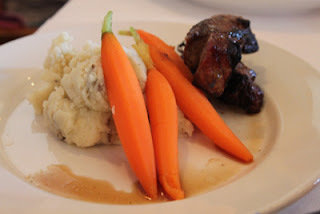 Her mashed potatoes did contain dairy, but you could substitute for a dairy free alternate side. She enjoyed her meal, considerably. I was so craving this pasta salad, I made one the day after we got home. Yum!